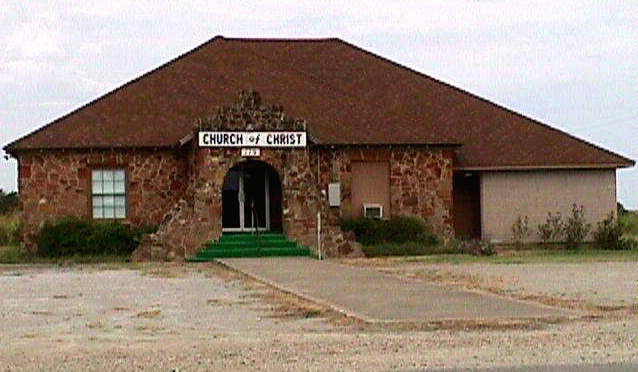 The Church of Christ in Lipan was begun like all other Churches of Christ. Gospel preachers came into the Lipan community. Christians from other places also moved into the Lipan area. They began to preach the word of God. Jesus said in the parable of the Sower that the Seed is the Word of God (Luke 8:11). That Seed was planted in the hearts of men and women on the first Pentecost after the resurrection of the Lord in the city of Jerusalem about A.D. 33 as recorded in Acts 2. The same Seed was also planted in the hearts of men and women in the Lipan area; they became the Church of Christ in Lipan. The Lipan Church of Christ was organized in 1904. The first church building was located west of the present school building on what is now a part of the school grounds. It was during W.R. Black's work in Lipan that the current church building was constructed in 1938. The church building was later remodeled in 1967. A parsonage was built next to the church building. In 1976, the present parsonage was built across the street just south of the tabernacle. Family names of long association with the Lipan Church of Christ are: Ator, Byrd, Ives, Rippetoe, Followell, Windsor, Herring, Bagwell, Thompson, Tuggle, Taylor, Odom, Richardson, Morris, Matney, Thormann, and Culberhouse. J.I. Bagwell, Hite Rippetoe, W.B. Byrd, Bill Followell, W.M. Windsor, Floyd J. Ator, Mack Thompson, Maurice Taylor, Butler Ives, Fred Thormann, Elmer Brock, A.J. Brumbaugh, Marvin Brock, and Charles Perkins. Brother James Scott-February 2, 1986 to July 26, 1987. Brother Scott had a stroke on July 21, 1987 and died on July 26, 1987.